The Boy Who Couldn't Sleep and Never Had To is DC Pierson's wildly, original debut novel that combines common coming-of-age experiences with an eccentric, though exciting plot that involves running from the government. Narrator and teenager Darren Bennett is an artist (not a draw-er, as some lame, prissy high-school girls call it) who keeps to himself for the most part. Dwelling in his own brilliant and creative imagination, all he wants to do is draw and work on a screenplay without bringing unnecessary attention to himself. When the odd and somewhat nerdy Eric Lederer approaches Darren one day to compliment him on his artwork and offer original ideas and plots for the screenplay, the two forge an incredible friendship. Having established trust, Eric lets Darren in on a big secret; Eric has never been able to sleep! Eric makes Darren swear to never tell anyone about his sleepless condition for fear that people like doctors and government officials will use Eric as a guinea pig for dangerous experiments. 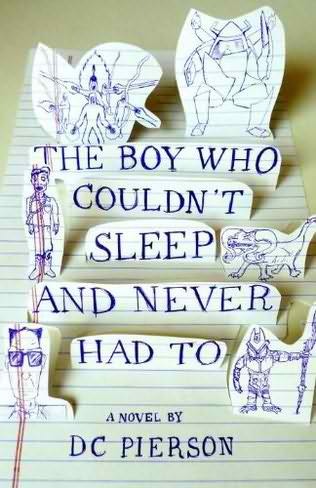 With a science-fiction premise that includes all the glory and humor of high-school awkwardness, The Boy Who Couldn't Sleep and Never Had To is a reading experience you won't soon forget! This novel is particularly brilliant because it's up for interpretation whether or not the government chase is a product of the boys' imagination or real. The first portion of the book really builds up how intelligent and creative both Darren and Eric are as they bounce ideas off each other for the screenplay, revealing to readers just how limitless their world has become. I love how author Pierson allows readers to decide on their own what they want to believe. In addition to having an amazingly fresh plot, this novel is also incredibly humorous. Numerous pop-culture references are made that are geared toward everyone; not just high-schoolers from recent years. The high-school cliques and personae mentioned are timeless, so readers of all ages will be able to relate. The Scholastic catalogs Eric refers to are indeed classic, especially when he rags on the "how-to-draw-comics" books -- which I do remember and that I did actually buy, haha! As for the coming-of-age aspect, it's so much more entertaining to read these accounts told from a boy's point of view for a change and not from a young girl's point of view, books of which have become tiring in all their abundance. This book's target audience is not geared solely toward teenagers, so don't judge this one by its cover! The Boy Who Couldn't Sleep and Never Had To is definitely one of the more original and intelligent novels I have read in recent years. I am highly anticipating future work by DC Pierson! Readers who enjoy this book will also like Dogface by Jeff Garigliano . This looks interesting and very different! great review! will have to look this up.